C'Sons in LaGrange, about an hour south of Atlanta, provides this small college town with fine dining. : C'Sons is located in LaGrange, a small college town about an hour south of Atlanta. 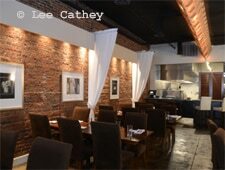 Although casual, the restaurant offers an air of elegance in off-white upholstered seating and bright white walls. Specific embellishments will vary as the menu changes, but chef Devin White nimbly arranges adornments to suit the center of plate. The house makes its own rémoulade for the crab cakes, and we thoroughly enjoy the scallops. To start, a generous cup of silky squash bisque, a special, paired nicely with the A to Z Pinot Gris from Oregon. Duck breast came medium rare and was accompanied by wild rice, wild mushrooms, an Asian slaw and a tomato glaze. New Zealand’s Maude Pinot Noir was a perfect match. Don’t care for duck but like the sides? Substitute an eight-ounce filet for the duck at no additional charge. For dessert, the tiramisu in just the right portion and good coffee wrap all up nicely. The wine list and wine stemware are many steps above what you would expect to find this far from Atlanta's dining frenzy. Service stumbles a bit on wine presentation, but is quick and hard-working. The noise level allows table conversation to proceed unhindered.